If you love to be social, you love food and you love not having to cook…Plan a Potluck! Invite your favorite people, especially those with exceptional culinary skills or farms, and have everyone bring their favorite healthy dish. Or assign each guest a particular course. Have a theme: Cowboy, Tapas, Green food, Salads, Must include an Egg, The letter B, whatever–get creative! 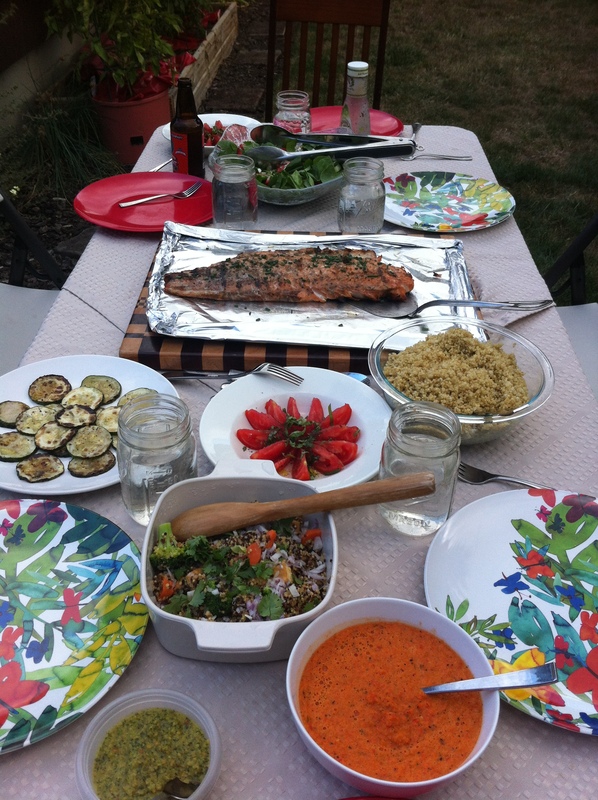 Pictured above is a backyard potluck, where our gracious host, Roger, actually caught the salmon and grilled it and made roasted red pepper salsa! Come to think of it, I don’t think I brought anything to this gathering! And I have a nutrition blog (you may have heard)! Ooooops! Wait, no, we brought beer and wine. Next Next post: RANT: A What-a-tarian?